Due to unexpected circumstances, I ended up being at home today and once the reason for that was being dealt with, I decided to play radio for a while. 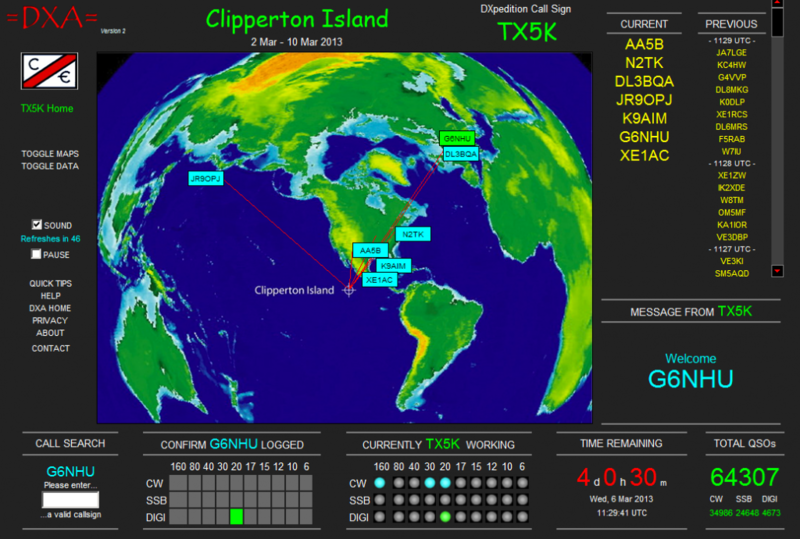 I’ve been looking to work the TX5K DXpedition to Clipperton Island since the weekend. I tried on Sunday but the pileups were absolutely massive and I didn’t manage to make myself heard. Today I noticed that they were on 20m RTTY and so I decided to give them another shout as they were a good S7 signal here. It only took half a dozen calls and they responded to me so we quickly completed the QSO. They’re running a useful online real-time log which you can access here. I did this directly after my QSO to be presented with this. A couple of hours later I was tuning around 15m and heard PJ7AA in Sint Maarten on CW. I’ve only worked PJ7 once before and that was back in 2011 on 10m so I called them for a nice new band and mode slot. Finally today I managed to work TX5K again but this time on 17m RTTY and I’ve uploaded that QSO to my audio snippets page. Not bad results for an unexpected day off! This entry was posted in Amateur radio, CW, DXpedition, HF, New DXCC, RTTY. Bookmark the permalink.